Some thoughts linked to my earlier post about the EPR paradox, arising from Dretske: Knowledge and the flow of information. I was arguing earlier that the issue with faster-than-light travel is to do with the communication of information. Ie, that the 'thing' you can't allow to go faster than light is information. But implicit in my reason for that was a direct link between causality and information: for A to cause B it is necessary to convey information from A to B. But Dretske argues that there is no such link between causality and information and, furthermore, argues that there can even be information flow backwards in time. If this were to be so, then clearly by argument about information flow in EPR would be incorrect. Dretske says that A can cause B without information from from A to B, and that information can flow from A to B without A causing B. 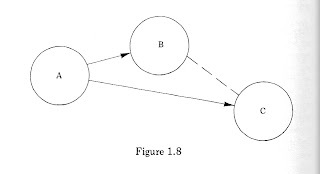 His arguments for these conclusions are illustrated by the following diagram (from Dretske, 1991, page 28). 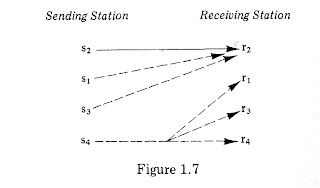 The arrows show causal connections: s2 causes r2 etc. Dretske argues that the causal link does not tell us anything about the information flow, because the fact that other events at s can also cause r2 means that the information r2 gives about s is reduced. So knowing that s2 causes r2 tells us nothing about the information about s learned from r2: causal link does not imply information flow. Similarly, s4 can cause any one of r1, r3, r4. Now r1 tells us s4, so r1 gives good information about s, even though we can't say 's4 causes r1'. Hence information flow does not imply causal connection. As to information flowing backwards in time, see Figure 1.8 from Dretske (page 38). Nothing at B causes anything at C or vice versa; yet C contains information about B and B about C. If C is further from the transmitter than B, the events occurring at C may occur later in time than those at B. [...] This sounds strange only if the receipt of information is confused with causality. For, of course, no physical signal can travel backwards in time carrying information from C to B.
I haven't read Dretske, but from what you say here I think he over-simplifies. Strictly, if r2 then (s1 or s2 or s3). That is certainly information. And we can say "s4 causes (r1 or r3 or r4)", and "s4 causes r1 sometimes", which is all information too, even though there's uncertainty in there. I believe we should consider there is a physical connection between B and C, even though it's not direct, but via A. When he says "C contains information about B", that is not a simple fact but requires knowledge of the A->B and A->C connections. Information and causation fit together very well when properly analysed. Personally, in the most general terms, I see causation, information flow and energy flow as three different aspects of one phenomenon. I've said more about this is a later post.